To start, you’ll need to create a perfectly smooth base. Givenchy Photo’Perfexion Foundation, £27.92 is like instant digital retouching, smoothing out the complexion and concealing imperfections for an air-light, flawless finish. For a truly perfect finish, apply with a quality foundation brush like the Clarins Professional Foundation Brush, £21.45, smoothing the foundation out from the centre of the face out to the hairline and jawline. Finish with a flush of pretty pink on the cheeks in the form of Too Faced La Vie En Rose Brightening Blush, £16.50, sweeping onto cheeks from the ears inward. Keep it fresh and rosy, as the eyes and lips are pretty bold! 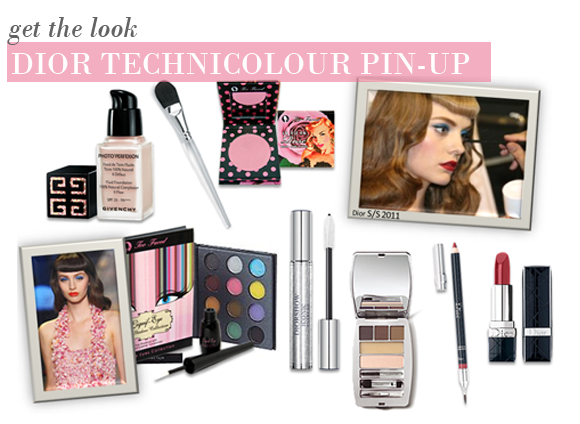 Although it’s not what you’d necessarily expect from a pin-up look, the bright pops of colour seen at the Dior Spring 2011 show were a refreshing take on 50s retro. To complement this Bettie Page-meets-The-Riviera look, the Dior models took to the runway in flashes of technicolour blue, pink, orange, yellow and green. An easy way to achieve the same effect is with the the Too Faced Liquif-Eye Kit, £23.00, a palette of bright eye colours. Apply the bright blue all over the lid for a flash of colour, and then carefully line the upper lashline with the black shadow mixed with a few drops of the included Liquif-Eye Liquid Liner. Finish with a few strokes of the Dior Iconic Extreme High Intensity Mascara, £20.94 for dark and luscious lashes. One of Bettie Page’s most defining features (apart from that trademark fringe) was her perfectly arched eyebrows. It was no different at the Dior show, with models’ brows being filled in, lifted and arched to perfection. Achieve the same with the Clarins Pro Palette Eyebrow Kit, £30.13, a palette with three shades to define and fill in your brows, a wax to fix them in place and a beige shadow to enhance the effect. To finish off the look, carefully line your pout with Dior Contour Lipliner in 863 Holiday Red. Then, dab on Rouge Dior Replenishing Lipcolour, £21.45 in 752 Favori to lips, the exact redcurrant shade used in the show. This entry was posted on Wednesday, January 19th, 2011 at 9:36 am and is filed under Hints & Tips, Make-up, Trends. You can follow any responses to this entry through the RSS 2.0 feed. You can skip to the end and leave a response. Pinging is currently not allowed.